Extreme Color offers all types of custom designed Marine Wraps. Call Extreme Color to update your graphics on your boat, trailer or personal watercraft. Our installers are experts in marine wraps and always take great pride in making sure your watercraft is installed with the highest quality workmanship and top quality 3M or Avery vinyl. 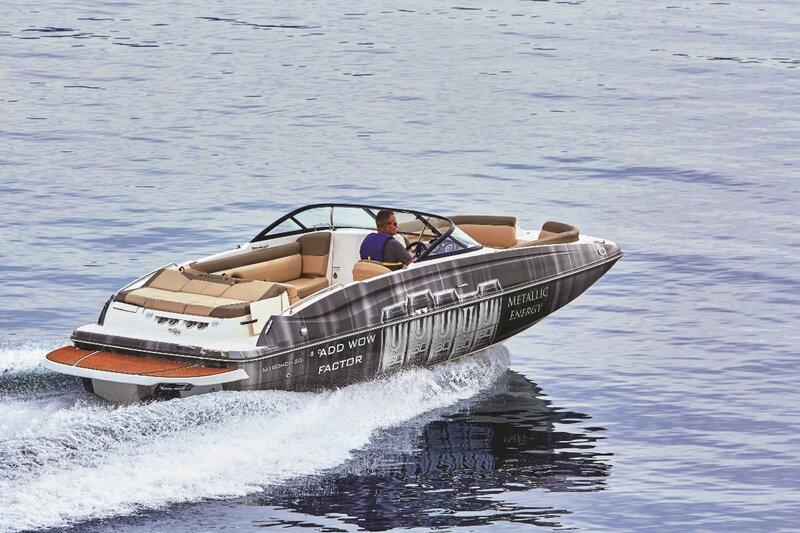 Extreme Color offers a wide variety of solid color change vinyl and specialty finishes that will transform your watercraft into something very unique. Solid color wraps come in hundreds of colors which include matte, satin, carbon fiber, chrome and other specialty finishes. This allows you to choose a color and finish for your solid color marine wrap that will define your particular style. If you are looking for a one of a kind custom design, we can create that unique look for you. Our designers are experienced in designing the look that will set you apart from the typical watercraft that you see on the water. We can design, print and install graphics that can get you noticed. Whether you are a captain of a weekend cruiser boat, a high performance boat or a tournament fisherman, we can create a custom design that sets you apart from the competition. Installing new premium graphics on your boat gives it a fresh new look and creates a distinctive design that is unique to you. Our marine wraps can be completed for much less than a custom paint job. With a vinyl marine wrap, you can easily change from one color to another or go back to your original paint color. Our knowledge and expert installation allows Extreme Color to be the preferred provider of custom marine wraps for many of Atlanta’s boaters. This speaks volumes about our ability to consistently perform as a top quality marine graphics installation company. Extreme Color has over 100 years combined experience in the color graphics printing market. Our expert team can design, print and install your marine wrap with confidence. Extreme Color takes pride in the way we produce your wrap, making most wraps seamless whenever possible. Our process makes it possible for you have the best looking boat wrap. Our professional design and installation sets us apart from our competition. Our personal approach and our ability to manage the project from design to installation make us the best choice for your marine graphics needs. Extreme Color isn’t a typical vinyl wrap company! We listen to our customers’ needs then apply our design and expertise to create your custom boat wrap. Extreme Color is the best choice for taking care of your custom color marine wrap. Extreme Color is proud to be one of the few vehicle wrap and large-format print companies to offer the most comprehensive finished graphics warranty in the industry. This one wins best in show. When you use finished graphics made with all 3M Graphics products and components, you’re protected for virtually any application. Graphics that stay looking great, even in the great outdoors. Do You Need Help Designing Artwork?